Some of these leadership traits are standard fare from a traditional business school text books. 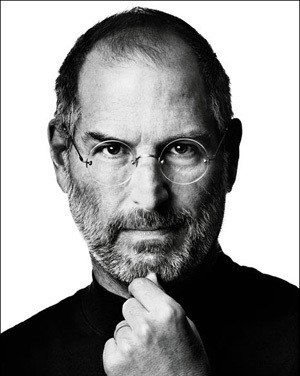 Others were clearly unique to Jobs' charisma and style. Regarding Jobs' charisma, Forrester's George Colony wrote an interesting article on companies that are run by charismatic leaders. He cites Max Weber's translated work, The Theory of Social and Economic Organization, which includes a discussion of the role of a charismatic leader within an organization. Weber wrote that the charismatic authority "is set apart from ordinary men and treated as endowed with supernatural, superhuman, or at least specifically exceptional powers or qualities." Wow. When you couple Jobs' design instincts and vision with his charisma, it's no wonder he was so successful. Regarding Jobs' style, I definitely cannot condone the way Jobs treated people. It is, antithetical to the management philosophy I learned early in my career at Hewlett-Packard (about treating others with respect). All in all, what's clear is that Jobs was certainly a unique individual. While I cannot commend his means, I definitely admire what was able to accomplish.